The Army headquarters on Saturday afternoon released the statement below announcing the killing of 16 Boko Haram terrorists who attacked troops stationed at Rann, in Kala Balge local government areas of Borno State. 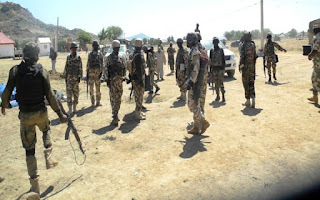 “Yesterday evening remnants of Boko Haram terrorists in their numbers attacked our troops location at Rann, Kala Balge Local Government Area of Borno State. “The terrorists came with Motorcycles Borne Improvised Explosive Devices (MCBIED), Anti-Aircraft Guns and other weapons at about 5.00pm and the exchange of fire lasted for some hours before they were overwhelmed by the troops firepower. “Unfortunately, one of the terrorists’ suicide bomber detonated himself at a gun truck killing the driver and the gunner. The truck and the mounted weapon were also damaged beyond repairs. In addition 2 soldiers were wounded in action while 3 others sustained minor injuries. “The troops killed 7 of the attackers instantly while quite a number escaped with gunshot wounds. During clearance operations this morning, the troops discovered 9 more Boko Haram terrorists dead bodies in the surrounding areas. Therefore the total number of terrorists killed was 16. “The bodies of the two fallen heroes and the wounded in action soldiers have been evacuated to Maiduguri, while reinforcement was sent from Gomboru Ngala. “In a related development, troops have also discovered and safely detonated 2 Improvised Explosive Devices (IEDs) planted along Gomboru-Rann road. It is believed that the IEDs were planted yesterday to prevent troops reinforcement to Rann while the attack lasted. “The Commanding Officer of 3 Battalion has visited the troops and held durbar with them. He commended them for their doggedness during attack and also urged them not to lower their guards. “Despite the incident, troops morale remains very high and they have continued with their clearance operations.